There are no important economic reports in the Great Britain or the USA to influence GBPUSD. 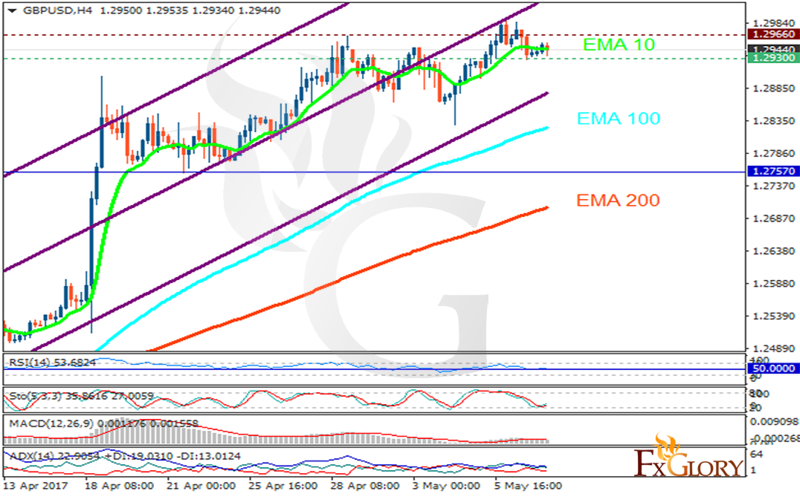 The support rests at 1.29300 with resistance at 1.29660 which both lines are above the monthly pivot point at 1.27570. The EMA of 10 is moving with bullish bias along the ascendant channel and it is above the EMA of 200 and the EMA of 100. The RSI is moving horizontally on the 50 level, the Stochastic is showing upward momentum and MACD indicator is in neutral territory. The ADX is not showing any clear signals. GBPUSD does not seem to be volatile today however, the resistance level breakout is a good signal for buying opportunity targeting 1.30 otherwise the pair will fall towards 1.28.